droneDyne is located in Halle in Belgium and ships their products to Europe. 10km range and 45min autonomy autopilot quadcopter. Our dD Quad 18 is designed to carry 3350 grams of payload for a flight time of 45 minutes. To achieve this, no compromise has been made. Carrying a Pixhawk, the most advanced controller on the market, the dD Quad 18 will allow you to plan complex missions. 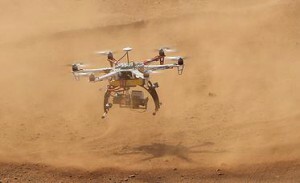 The dD Quad 18 can even be controled via your smartphone and follow you automatically. Its four 18 inches propellers are spinning slowly compared to common multicopters, that means it is much more efficient than conventionnal multicopters and allows a great autonomy. It uses the latest technology to drive the motors using BLHeli firmware, the most secure and efficient ESC firmware on the market. The use of custom made Orange RX modules flashed with Ultimate LRS firmware offer a 10km range with telemetry link included in the remote control transmission, you can even connect your remote control to your PC or smartphone via bluetooth to use mission planner. The dD Quad 18 can be equiped with a parachute and custom made safety system for operation in critical environment. At droneDyne, we like transparency, that’s why you can download an Excel file and see every components used to build this drone with their price. If you want to order this model you can write to us or save the Excel file on your local hard drive, edit the quantity of each product and then send and it via our contact page. The best racing drone on Ardupilot. You want a drone that can not only be used as a low riding FPV drone (you know, the star wars style racing in the woods) but which can also do everything like the bigger ones? Don’t look further, our version of the Trifecta is equiped with an HKPilot micro running Ardupilot. With its GPS module it can fly on its own on autonomous missions, you can use the GPS to assist you during the flight and it can return to its launch point by itself! The droneDyne Trifecta has an ultra low latency response to allow extreme reaction speeds, the recommended camera for low riding is the RunCam HD 2 which offers a 40ms latency and the RC receiver is connected to a customized APM micro board using SBUS protocol which is faster than CPPM. 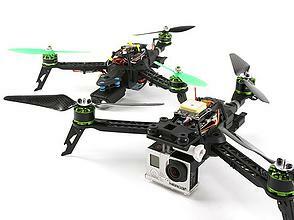 Its tricopter design allows ultra fast reactions on the yaw axis unlike classic quadricopters racers. This drone is perfect for learners, it is way more resitant to crashes than the bigger drones and its parts are way cheaper. The remote control, the FPV screen and/or the FPV glasses are compatible with every droneDyne products, no need to buy several remote controls unlike other brands. As usual you can consult our price and component list to build it yourself or you can write to us to get a personalized offer. The Trifecta can carry either a GoPro or a Mobius camera. The 3DR Y6 is the best drone for travellers, it folds easilly and fits in a normal luggage. 3DR sells its drone ready to fly or in a DIY kit but they don’t sell a complete FPV set with the best Chinese products such as the FrSky Taranis radio, SkyZone 5,8GHz video system and FeiyuTech G3 gimbal. That’s why we have built a complete component list and provide trainings for those who want to start easily in the ardupilot world, thanks to our training sessions and complete set of components. You can find a presentation video here.. Please find here the Excel file which you can use to set up your own 3DR Y6 or to order a (really) ready to fly kit. 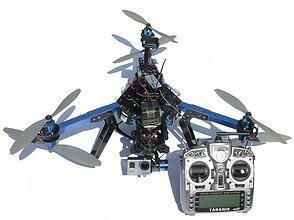 We can provide several kinds of drones, even based on RC planes. Don’t hesitate to contact us, describe your needs and ask for a quote. You can find here a list of question you could answer to help us determine the best solution that fits your needs. 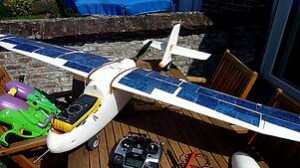 On the picture above you can see a prototype of solar plane, this plane is able to fly autonomously while carrying a GoPro camera. 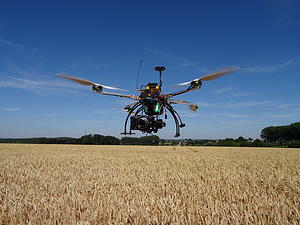 On the right you can see a DJI F550 with a Naza-M controller, the brushless gimbal is able to carry an hybrid camera.